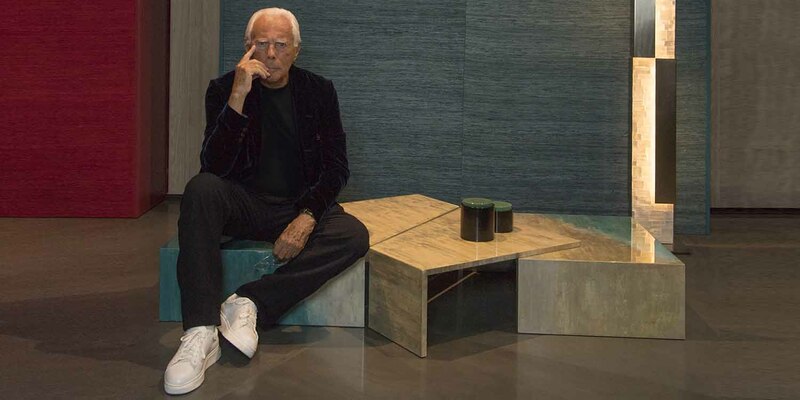 If architecture is for creating impactful solutions that arrange spaces with symmetry, ‘My job,’ says Giorgio Armani, ‘is to bring them to life using my aesthetic awareness. Staying true to his design philosophy, Giorgio Armani infused a sense of poetry to the Armani/Casa 2018 collection which easily felt and seen in these small objects that narrate a story of artisanal skill and cultural tradition. Outstanding among the new-found materials is Murano glass, guaranteed by the Armani/Casa Murano logo and made distinctive by the year or creation engraved under the glass. The unusual ribbed glass in opaque paste of the Narciso vases is produced by hand. Neuen, available as a loose change bowl as well as a box in glass paste with stone effect, is also preciously manufactured. A statement of quality is also made by the ornamental wood leaf-shaped bowl Naoki, which can be a practical loose change holder; it is clearly the end result of rare artisan craft. Sculpted from a whole trunk, a method that allows for a play on concentric rings, this multi-layered item has a high-gloss finish that enhances its soft hues of blue, dark grey and green. Lacquered wood with an intense color and alabaster are combined in the Notte two-tone decorative lanterns, with rounded shapes with indigo and red lines, which add a special light-effect. The art de la table is played out in the sophisticated chopstick set Naike, which is made up of two octagonal chopsticks in ebony with a matte finish and a chopstick support whose holes in the central part contain the 3 chopsticks, while a small groove in the center allows them to be put down during the meal. The chopsticks are longer for men, 23.5 cm, and shorter for women, 22.5 cm, and draw out like small swords from their case. The Nodo set for laying the table on board boats is a waxed blue linen set with beige leather cords and includes tablemats and runners with contrast edges, a cutlery holder and various serving trays that act as containers. The Nardo puzzle is dedicated to fans of the most advanced brain teaser, while the Nikki and Niven storage boxes are eye-catching in their vivid colors and optical inlays.